The number of donated human organs and tissues falls far short of the need, a situation that threatens the life of many potential recipients. Alternative techniques such as xenotransplantation are therefore urgently needed. The pig is the preferred donor species for a number or reasons, including size, anatomical and physiological similarities with humans, and efficient techniques for genetic engineering/gene editing. Technical advances in the generation of genetically multi-modified pigs and new developments in the field of immunosuppression have supported significant progress in many areas of xenotransplantation, including pancreatic islets, neuronal cells, and corneas, but also vascularized organs, especially kidney and heart. With the DFG-funded Transregional Collaborative Research Center 127 “Biology of xenogeneic cell, tissue and organ transplantation” (http://www.klinikum.uni-muenchen.de/SFB-TRR-127/de/) we are generating genetically multi-modified pigs to overcome rejection mechanisms and physiological incompatibilities of pig-to-primate xenografts. Hyperacute rejection of pig-to-primate xenografts is triggered by binding of preformed antibodies to specific xeno-antigens. Subsequent activation of the complement system cannot be controlled due to species incompatibilities between the regulators on the xenograft and the recipient's effector molecules. The major xeno-antigen is galactose-α1,3-galactose (αGal) synthesized by α-1,3-galactosyltransferase (GGTA1). Other prominent xeno-antigens are N-acetylneuraminic acid (Neu5Gc, also called Hanganutziu-Deicher antigen) synthesised by cytidine monophosphate-N-acetylneuraminic acid hydroxylase (CMAH) and an Sd(a)-like glycan made by porcine β-1,4-N-acetyl-galactosaminyl transferase 2 (B4GALNT2). A first step to overcome hyperacute rejection of pig-to-primate xenografts was the generation of transgenic donor pigs that express human complement-regulatory proteins, such as CD46 (membrane cofactor protein; MCP), CD55 (complement decay-accelerating factor, DAF), CD59 (membrane inhibitor of reactive lysis, MIRL), singly or in combination. These attenuate complement activation and significantly prolong survival of pig-to-primate xenografts. A major step towards long-term survival of vascularized pig-to-primate xenografts was the inactivation of the porcine GGTA1 gene. In addition, innate and adaptive components of the cellular immune system contribute to xenograft rejection. Immune cell infiltration of tissue and solid organ xenografts starts with neutrophils, followed by macrophages and T cells. In addition, natural killer (NK) cells may induce endothelial cell activation in the xenograft and lyse porcine cells directly and via antibody-dependent cytotoxicity. Cellular xenografts such as porcine islets in non-human primates are mainly rejected by CD4+ T cells. The CD80/CD86-CD28 T-cell co-stimulation pathway can be blocked by systemic treatment with CTLA4-Ig (abatacept®) or LEA29Y (belatacept®). These molecules can also be expressed in genetically modified donor pigs, opening the prospect of inhibiting T-cell activation locally at the graft site, thus avoiding systemic immunosuppression of the recipient and the consequent risk of infection. LEA29Y expressing transgenic porcine neonatal islet cell clusters (NICCs) transplanted into immunodeficient diabetic mice normalized blood glucose levels and, in contrast to wild-type NICCs, were not rejected after the recipient mice were reconstituted with human immune cells (Klymiuk et al., Diabetes 61: 1527-32, 2012; Wolf-van Bürck et al., Sci Rep 7: 3572, 2017). For monitoring of maturation and proliferation of NICCs we generated transgenic pigs expressing eGFP under the control of the porcine INS promoter (Kemter et al., Diabetologia 60: 1152-1156, 2017). Dysregulation of coagulation and disordered hemostasis are frequent complications in preclinical pig-to-nonhuman primate xenotransplantation. While porcine thrombomodulin (THBD) on xenogeneic endothelial cells binds human thrombin, it is a poor co-factor for activation of human protein C. We thus generated transgenic pigs expressing human THBD under the control of porcine THBD regulatory sequences (Wünsch et al., Transplantation 97: 138-47, 2014). A GGTA1 knockout, hCD46 transgenic pig heart with the latter THBD expression vector survived for more than 900 days after heterotopic abdominal transplantation into a baboon with appropriate immunosuppression (Mohiuddin et al., Nat Commun 7: 11138, 2016). 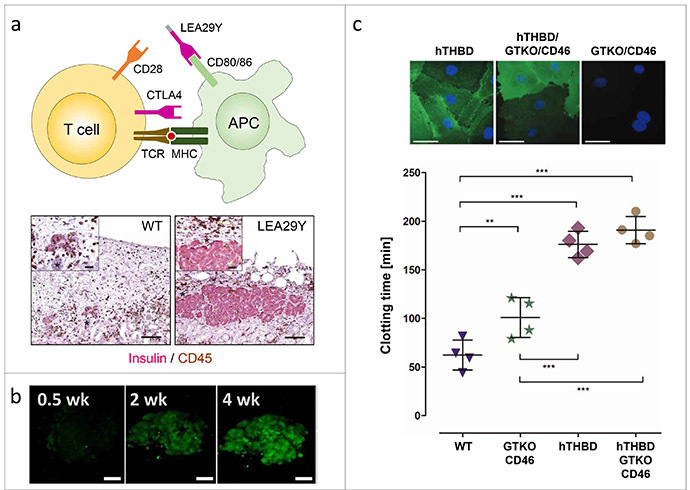 a) Neonatal islet-like cell clusters (NICCs) from INS-LEA29Y transgenic pigs are protected against rejection in diabetic mice with human immune cells. b) Monitoring of maturation and expansion of NICCs with an INS-eGFP reporter gene. c) Expression of human thrombomodulin (hTHBD) in wild-type or GGTA1 knockout (GTKO)/human CD46 transgenic porcine vascular endothelial cells delays clotting of non-anticoagulated human blood.